Most Americans following news about the WikiLeaks website’s release of a huge trove of classified documents about U.S. diplomatic relations see the revelations – which have received extensive media coverage – doing more harm than good. Six-in-ten (60%) of those paying attention to the story say they believe the release of thousands of secret State Department communications harms the public interest. About half that number (31%) say the release serves the public interest, according to the latest News Interest Index survey conducted Dec. 2-5 among 1,003 adults. Yet the public makes a distinction between WikiLeaks itself and the press’ handling of the document release. While nearly four-in-ten (38%) of this group say news organizations have gone too far in reporting the confidential material, a comparable number (39%) say the media has struck the right balance. Just 14% say news organizations have held back too much of the classified material. 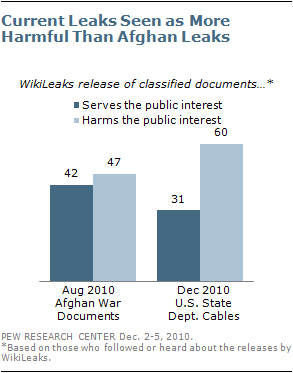 In August, the public was more divided about the impact of the release by WikiLeaks of thousands of classified documents about the war in Afghanistan. At that point, 47% of those who had heard at least a little about the story said the release harmed the public interest, while 42% said it served the public interest. Economic news topped the public’s news interest last week with 25% saying they followed news about the economy more closely than any other top story; 52% say they followed economic news very closely, the highest number since mid-summer. Three-in-ten (30%) say they followed the WikiLeaks developments very closely. This was the top story for 7%. For its part, the media devoted 16% of coverage to the WikiLeaks story, according to a separate analysis by the Pew Research Center’s Project for Excellence in Journalism. Tallying together the economic themes, PEJ found them receiving more than a quarter of coverage: the economy in general (11%), the debate over what to do about the Bush era income tax cuts (11%) and discussions in Washington about how to reduce the federal deficit (7%). In the survey, nearly two-in-ten (17%) say they followed the debate over tax cuts most closely, while 6% say they followed news about deficit reduction proposals that closely. 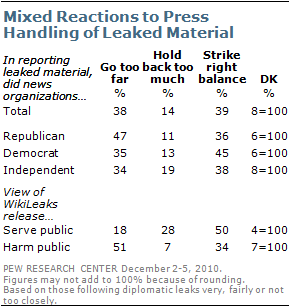 Fully three-quarters of Republicans following news about the WikiLeaks release of classified diplomatic communications say it harms the public interest (75%), while about two-in-ten (19%) say it serves the public interest. The balance of opinion among Democrats and independents tilts the same way, but the divide is narrower. 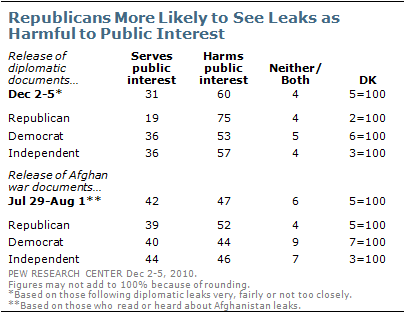 In mid-summer, following release of classified documents about the war in Afghanistan, partisan differences were slight. About half of Republicans (52%) said that release harmed the public interest, compared with 44% of Democrats and 46% of independents. About four-in-ten of each said the release served the public interest. Looking at the media’s handling of the recently leaked State Department cables, more Republicans (47%) than Democrats (35%) or independents (34%) say news organizations have gone too far in reporting the material, but none of these is a majority. By the same token, 45% of Democrats, 38% of independents and 36% of Republicans say the media has struck the right balance. About half (51%) of those who say the leaks harm the public interest also say news organizations have gone too far in reporting on the leaked material. Still, 34% of this group say the media has struck the right balance. Half of those who say the leaks serve the public interest say the media has struck the right balance, but nearly three-in-ten (28%) say news organizations have held back too much; 18% say they have gone too far. 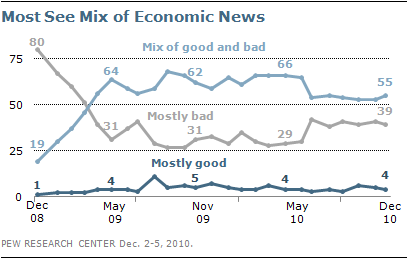 The public’s perceptions of economic news remain mixed and far less positive than earlier in 2010. More than half (55%) say they are hearing a mix of good and bad news about the economy; 39% say they are hearing mostly bad news while just 4% say they are hearing mostly good news. Those numbers have changed little since July, when perceptions of economic news took a turn for the worse. Partisan perspectives are largely unchanged over the past month. Republicans remain more likely than Democrats to say they are hearing mostly bad news (50% vs. 29%); Democrats are more likely to say they are hearing a mix of good and bad economic news (65% vs. 47%). Among independents, 55% say they are hearing a mix of good and bad news and 40% say they are hearing mostly bad news about the economy. Looking at coverage of different sectors of the economy, the public continues to see mostly bad news about jobs and real estate. But after news reports about solid retail sales around Thanksgiving, Americans give a relatively upbeat assessment about retail news. Two-thirds (66%) say they are hearing mostly bad news about the job situation, while 62% say they are hearing mostly bad news about real estate values. Those numbers are little changed from the last time this question was asked in early September. Just 18% say that news about retail sales has been mostly bad. A third (33%) say this news has been mostly good, more than double the percentage saying this for any of the other sectors in the question; 45% say the news about retail sales has been a mix of good and bad news. Perceptions of news about the financial markets and consumer prices show only slight changes since September. 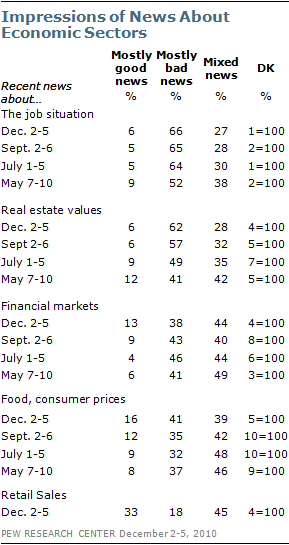 About four-in-ten (41%) say news about food and consumer prices has been mostly bad; 39% say this news has been mixed. 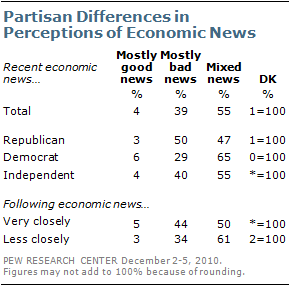 A similar 38% say news about financial markets has been mostly bad, while 44% say this news has been mixed. With the government’s release of worse-than-expected employment numbers on Dec. 3, about half of the public (52%) says they followed economic news very closely last week. That’s the highest number to say this since mid-summer. 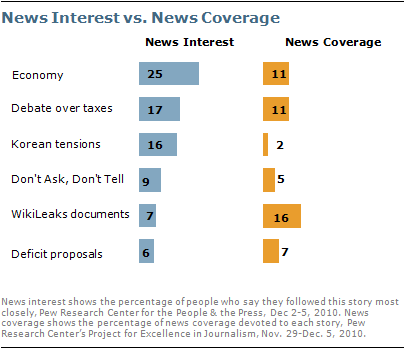 A quarter (25%) say they followed news about the economy more closely than any other top story. About four-in-ten (39%) say they very closely followed news about the debate over whether to extend the Bush era income tax cuts; 17% say this was the story they followed most closely. Though the tensions between North and South Korea amounted to just 2% of the week’s newshole, Americans took an interest in the story: 35% say they followed this news very closely, while 16% say this was the news they followed most closely. Three-in-ten (30%) say they followed news about the WikiLeaks release very closely, while 7% say they followed this story most closely. The story accounted for 16% of coverage. About a third (35%) very closely followed news about recommendations for reducing the federal deficit, while 6% say this was the news they followed most closely. 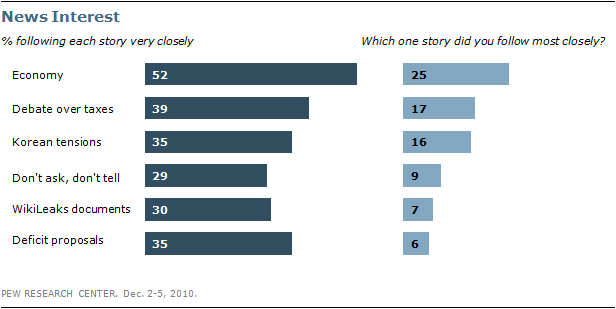 Those stories accounted for 7% of coverage. More Democrats say they tracked news about the ‘Don’t Ask, Don’t Tell” policy very closely (39%) than Republicans (25%) or independents (23%). On the other stories, partisan differences were slight. These findings are based on the most recent installment of the weekly News Interest Index, an ongoing project of the Pew Research Center for the People & the Press. The index, building on the Center’s longstanding research into public attentiveness to major news stories, examines news interest as it relates to the news media’s coverage. The weekly survey is conducted in conjunction with The Project for Excellence in Journalism’s News Coverage Index, which monitors the news reported by major newspaper, television, radio and online news outlets on an ongoing basis. In the most recent week, data relating to news coverage were collected November 29 to December 5, and survey data measuring public interest in the top news stories of the week were collected December 2-5, from a nationally representative sample of 1,003 adults. Results for this survey are based on telephone interviews conducted under the direction of Princeton Survey Research Associates International among a national sample of 1,003 adults living in the continental United States, 18 years of age or older, from December 2-5, 2010 (671 respondents were interviewed on a landline telephone, and 332 were interviewed on a cell phone, including 146 who had no landline telephone). Both the landline and cell phone samples were provided by Survey Sampling International. Interviews were conducted in English.